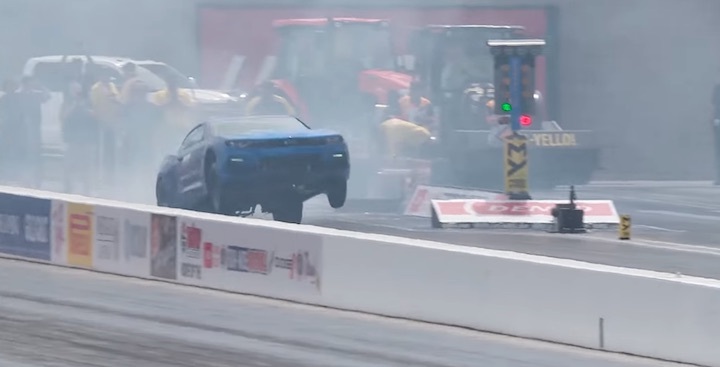 Back in February, we shared a video with you of the electric Camaro eCOPO drag racer achieving the goal that General Motors had set for it of dipping into the nine-second range in the quarter-mile. In that video, the zero-emission dragster hooked up perfectly and turned in a 9.837-second pass at a trap speed of 134.07 mph. Now we’re bringing you another video of the electric Camaro eCOPO at the drag strip – although this pass isn’t notable for its speed. This time the eCOPO hooks up a bit too well and pulls an absolutely massive wheelie, squatting all the way back on its wheelie bar before dropping its nose back down and almost losing control before the driver gets things straightened out. The electric Camaro eCOPO was designed and engineered by GM and is run by drag racing team Hancock & Lane. It makes 800 horsepower and an instantaneous 634 pound-feet of torque thanks to its twin electric motors and 32 kWh battery. This may surprise you, but all that electric power is sent through the same three-speed automatic transmission that is found in the regular gas-powered COPO Camaro. The eCOPO’s impressive wheelies are the result of its torquey electric motors, but the location of the battery packs may also have something to do with it. With one located where the Camaro’s spare tire normally sits and another over the rear axle, the car has quite a bit of its weight at the rear. This also helps the car put all that torque to the ground, though. Watch the eCOPO rip a huge wheelie in the video embedded above. Subscribe to GM Authority (for free) for the latest Camaro news, Chevrolet news as well as around-the-clock GM news coverage. good driving, no over reaction. Man, that thing can hook! If all of the weight is in the rear, this is far from impressive….